InsideTheGrandPrix.com – Multichannel Marketing | ASTRALCOM - Content Strategy, Conversion Marketing and Customer Acquisition. InsideTheGrandPrix.com – Multichannel Marketing | ASTRALCOM – Content Strategy, Conversion Marketing and Customer Acquisition. Not everyone gets the kind of access to sporting events that the press and the event workers get. These pros get behind the scenes and “in the trenches” of the event – seeing, hearing and otherwise experiencing things that general admission fans never get to experience. The Annual Toyota Grand Prix of Long Beach runs through the streets of downtown Long Beach and generates an economic impact of approximately $39 million-making it the largest paid spectator special event in Southern California. While the three-day event weekend draws over 225,000 spectators, only a select handful of individuals are allowed access to “behind-the-scenes” areas. Even before the race started, we had divided the event into specific categories and assigned team coverage to these areas. The teams were equipped with walkie-talkies, recorders, cameras and other necessary equipment. Each coverage team consisted of a “spotter” (to keep their eyes open for photo opps, celebs, and interviews, etc) and a photographer and/or sound technician (to capture the experiences of the sights and sounds of the event). 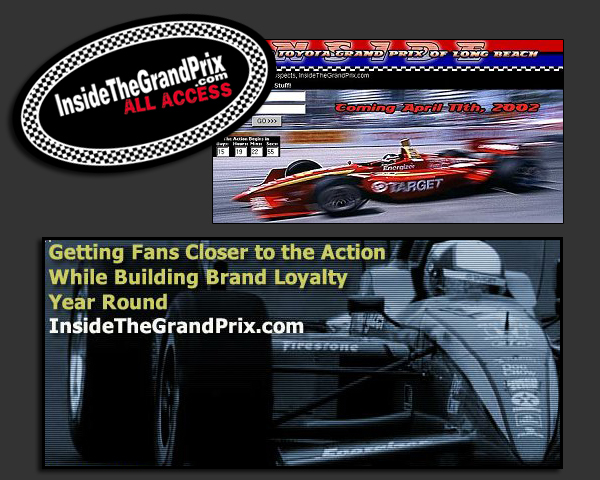 In the end, InsideTheGrandPrix.com served as the perfect platform by which to bring race fans closer to the action, create new cross-promotional opportunities and increase overall fan loyalty. Contact us today to implement a winning marketing plan like this for your business.